Monday - Friday, gates open at 5 p.m.
Saturday - Sunday, gates open at 1 p.m. The Fort Bragg Fair is an annual event that takes place every spring. Unlimited carnival rides and live entertainment are included in one, low admission price. Parking is free. Open to the public, with easy access off Bragg Blvd. ADA parking accessible from Bragg Blvd. via Howell St.
Q: How do I get to the Fort Bragg Fairgrounds? A: From Fayetteville: Take Hwy 87 North. Turn Right onto Howell St. Turn Left onto Watson St. The Fort Bragg Fairgrounds will be on your right. From Spring Lake: Traveling South on HWY 87, turn left onto HWY 210 (Murchison Road). Take ramp on right onto I-295 S. Take the exit on right toward HWY 87 (Bragg Blvd). Turn Left onto HWY 87. Turn Right onto Howell St. Turn Left onto Watson St. The Fort Bragg Fairgrounds will be on your right. A: Yes! See "Admission Specials" under "Cost", located directly below. Q: Are there vending opportunities at the fair? A: There are no vending opportunities at the Fort Bragg Fair. 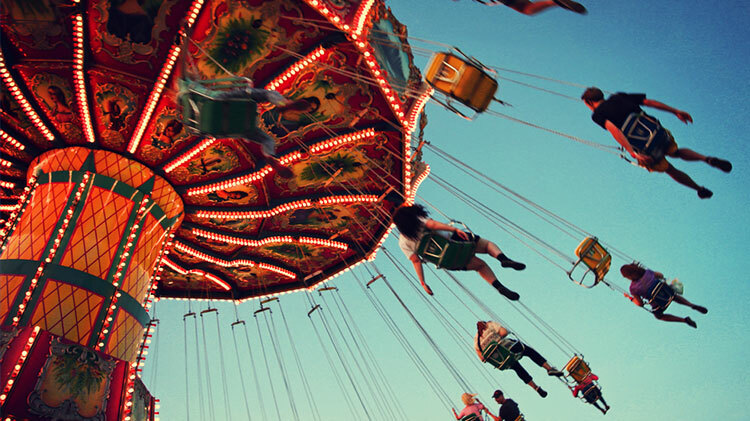 Our carnival ride provider has long-term vendor concessionaire contracts in place. The vendors travel with the fair February through November annually. Customer Appreciation Days. Monday - Friday from 5-7 p.m. $9 admission. Mother’s Day. Sunday, May 12. Mothers are admitted for free when accompanied by a paying child, who is 36" or taller, up to age 17.